"Materials in nature are rarely homogeneous," says Xu. "Functional polymer materials often consist of nanoscale domains that have specific tasks. Cellular membranes are embedded with proteins that are nanometers in size. Nanoscale defects of materials exist that affect their mechanical and chemical properties. "PFIR microscopy represents a fundamental breakthrough that will enable multiple innovations in areas ranging from the study of aerosol particles to the investigation of heterogeneous and biological materials," says Xu. 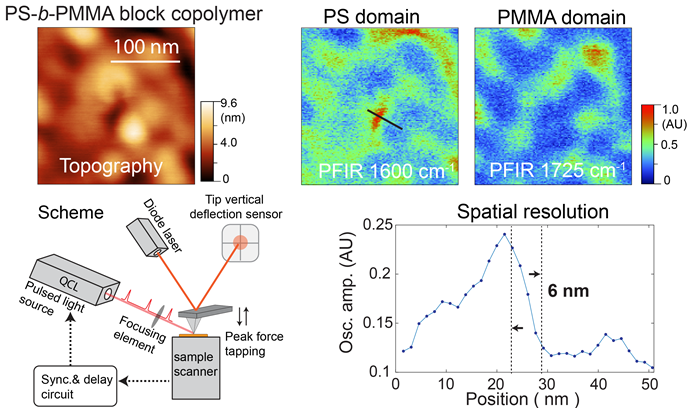 Xu and his group recently reported their results in an article titled "Nanoscale simultaneous chemical and mechanical imaging via peak force infrared microscopy." The article was published in Science Advances, a journal of the American Association for the Advancement of Science, which also publishes Science magazine. The article's lead author is Le Wang, a Ph.D. student at Lehigh. Coauthors include Xu and Lehigh Ph.D. students Haomin Wang and Devon S. Jakob, as well as Martin Wagner of Bruker Nano in Santa Barbara, Calif., and Yong Yan of the New Jersey Institute of Technology. "PFIR microscopy enables reliable chemical imaging, the collection of broadband spectra, and simultaneous mechanical mapping in one simple setup with a spatial resolution of ~10 nm," the group wrote. "We have investigated three types of representative materials, namely, soft polymers, perovskite crystals and boron nitride nanotubes, all of which provide a strong PFIR resonance for unambiguous nanochemical identification. Many other materials should be suited as well for the multimodal characterization that PFIR microscopy has to offer. "In summary, PFIR microscopy will provide a powerful analytical tool for explorations at the nanoscale across wide disciplines." Xu and Le Wang also published a recent article about the use of PFIR to study aerosols. Titled "Nanoscale spectroscopic and mechanical characterization of individual aerosol particles using peak force infrared microscopy," the article appeared in an "Emerging Investigators" issue of Chemical Communications, a journal of the Royal Society of Chemistry. Xu was featured as one of the emerging investigators in the issue. The article was coauthored with researchers from the University of Macau and the City University of Hong Kong, both in China. "A material is not often homogeneous," says Xu. "Its mechanical properties can vary from one region to another. Biological systems such as cell walls are inhomogeneous, and so are materials with defects. The features of a cell wall measure about 100 nanometers in size, placing them well within range of PFIR and its capabilities." "Our technique is more robust," says Xu. "It works better with soft materials, chemical as well as biological." "If there is something of interest chemically on a surface," Xu says, "I put an AFM [atomic force microscopy] probe to that location to measure the peak-force infrared response. "It is very difficult to obtain these spectra with current scattering-type scanning near-field optical microscopy. It can be done, but it requires very expensive light sources. Our method uses a narrow-band infrared laser and costs about $100,000. The existing method uses a broadband light source and costs about $300,000." "No other spectroscopy method can do this," says Xu. "Is a material rigid or soft? Is it inhomogeneous—is it soft in one area and rigid in another? How does the composition vary from the soft to the rigid areas? A material can be relatively rigid and have one type of chemical composition in one area, and be relatively soft with another type of composition in another area. "Our method simultaneously obtains chemical and mechanical information. It will be useful for analyzing a material at various places and determining its compositions and mechanical properties at each of these places, at the nanoscale." "We use a table-top laser to get infrared spectra. Ours is a very compact light source, as opposed to the much larger sizes of competing light sources. Our laser is responsible for gathering information concerning chemical composition. We get mechanical information from the AFM. We integrate the two types of measurements into one device to simultaneously obtain two channels of information."